Handmade greeting card is fun and different. 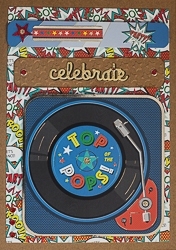 "Celebrate" with this layered card that provides texture and excitement. Panel inside is blank and ready for your special message, or read below for more options. Card size is 5" by 7" and has gold foil accents. Note: Available in quantity of one. ~ Further details: We can send the card directly to your recipient with no pricing invoice by letting us know the shipping address is for the recipient when checking out. You can include your message or greeting in the comments box at checkout and we will put it inside the card. When shipped directly to your recipient, it will be mailed in the envelope intended for use with the card itself and the return address will be the one included for the buyer on the order. When shipped to the Buyer, the card and its envelope will arrive inside of another mailer for use. Some card sizes or layered cards can require more than a regular stamp, so please check with the post office when mailing it yourself. Note: Em includes a business card size calendar with every order.